How To Apply Nail Fungus Treatment? Do you have the best nail fungus treatment for your infected nails? The best treatment that you consider will be effective if you apply it correctly. 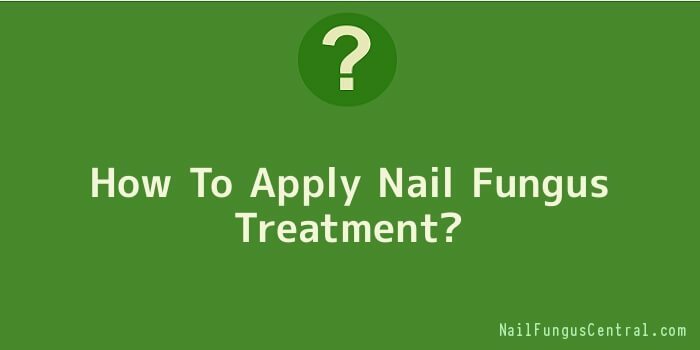 So, it is important that you learn how to apply the nail fungus treatment before you actually start your treatment process. Step 1 – Keep the infected nails dry and without any moisture. You may use a very clean towel or a hair blow dryer to get rid of all moisture. This is done after you have washed your nails. Step 2 – If you are using a topical medicine, which is the best nail fungus treatment; apply the medicine with a brush applicator. Apply the medicine liberally to the infected areas and make sure that the medicine is well distributed across the entire infected nails. Step 3 – Apply the topical medicine or solution under the nails and the surrounding areas to make sure that all are covered. The surrounding areas are best to make the medicine penetrate the infected nails and reach the actual source of the fungus. After you have applied the topical solution, inspect the infected areas and make sure that there is no spot that has been missed.